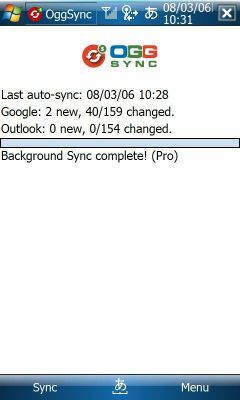 This was my life for a whole year before we started working on Google Calendar Sync, a 2-way synching application between Google Calendar and the calendar in Microsoft Outlook. I was probably the most excited person on the team when we started developing it, because now I can access my calendar at home or on my laptop, on Google Calendar or in Outlook. When I add an event to the Outlook calendar on my laptop, Google Calendar Sync syncs it to my Google Calendar -- and since I also have Google Calendar Sync running on my desktop, the event then syncs from Google Calendar to Outlook calendar on my desktop. Keep in mind that it's not possible to sync events on secondary calendars at this time. Google Calendar Sync will only sync events from your primary Google Calendar and your default Microsoft Outlook calendar. Today Google announced support for Contact access to GMail and Google Apps. OggSync is announcing version 4.0 which will include native sync with Google Contacts. Now, OggSync will keep your contacts in sync with your Outlook, Google Mail and Windows Mobile devices natively.